Recent trends in healthcare have focused on clinics being built at sites away from hospital campuses. In the Twin Cities, most of the recent real estate developments in healthcare have been at off-campus locations. 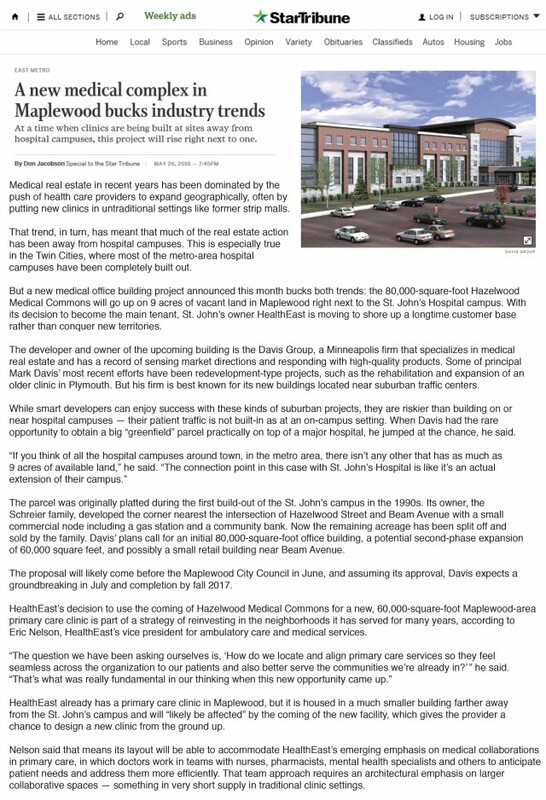 Going against this trend, Davis is developing a new 80,000 SF medical complex on 9 acres of vacant land right next to the St. John’s Hospital campus in Maplewood, MN. The new development will be called Hazelwood Medical Commons and will feature HealthEast as a major tenant. Davis is also planning a second-phase expansion of 60,000 SF of additional healthcare space.